Thirumala Kanneganti, PhD, recently received the 2018 Eli Lilly and Company-Elanco Research Award, the ASM's oldest and most prestigious prize. She was also recognized by the Society for Leukocyte Biology with the 2017 Dolph O. Adams Award, named for the outstanding macrophage researcher Dolph O. Adams, MD, PhD. The American Society for Microbiology recently awarded Thirumala-Devi Kanneganti, PhD, the 2018 Eli Lilly and Company-Elanco Research Award, the ASM’s oldest and most prestigious prize. It rewards fundamental research of merit in immunology by an early-career scientist. Dr. Lee-Ann Allen (left), president-elect of the Society for Leukocyte Biology and professor of Internal Medicine – Infectious Diseases and Microbiology and Immunology at the University of Iowa, presents Thirumala Kanneganti, PhD, the 2017 Dolph O. Adams award. Photo by Dr. Nathan Shankar of the University of Oklahoma College of Pharmacy. In addition, the Society for Leukocyte Biology presented Dr. Kanneganti with the 2017 Dolph O. Adams Award, named for the outstanding macrophage researcher Dolph O. Adams, MD, PhD. It recognizes excellence in research into cellular and molecular mechanisms of host defense and inflammation. I was honored to nominate Dr. Kanneganti, a member of the Immunology Department at St. Jude, for the award this year. 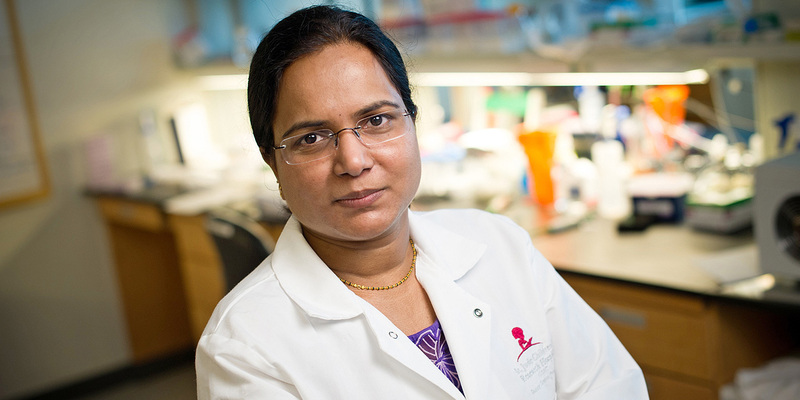 Dr. Kanneganti joined the St. Jude faculty in 2007, and her lab studies fundamentals of innate immunity, the body’s first line of defense against infection. Her studies not only explore how our body and the immune system respond to infectious agents, but have proven critical in determining how our immune system affects the development of several debilitating diseases, including cancer. Dr. Kanneganti’s efforts are providing important insights for the development of new, targeted therapeutics. Dr. Kanneganti is a visionary scientific leader who has made major discoveries in understanding how foreign nucleic acids and other microbial products trigger inflammasome activation and inflammation. Research from her lab has been published in more than 190 original peer-reviewed publications, with many of the studies appearing in top-ranking scientific journals. She is a regularly invited speaker at scientific conferences around the world and serves as the Chair of the National Institute of Health Innate Immunity and Inflammation study section. The American Association of Immunologists has recognized her contributions to the field of immunology by selecting her for the AAI-BD Biosciences Investigator Award in 2015. Dr. Kanneganti was also recently elected a Foreign Fellow of the Telangana Academy of Sciences and to the Society of Mucosal Immunology Board of Councilors. “Her efforts are highly regarded in the immunology community and her research has helped raise the profile of our department,” said Peter Doherty, PhD, Emeritus faculty member in the Department of Immunology and Nobel Laureate. We’re grateful to have an outstanding scientist in Thirumala, and look forward to what she will discover in the future. These awards are an honor and a testament to her incredible abilities and talent, and the support she’s received throughout the years from colleagues and staff. Thanks to the outstanding resources that St. Jude has provided, Dr. Kanneganti has been able to perform investigations that have been fundamental in providing an in-depth understanding of biological pathways responsible for the innate immune response and cytokine signaling. Terrence L. Geiger, MD, PhD, is Senior Vice President and Deputy Director for Academic and Biomedical Operations, medical director of Clinical Pathology and a St. Jude Endowed Chair in Pediatrics. View full bio.